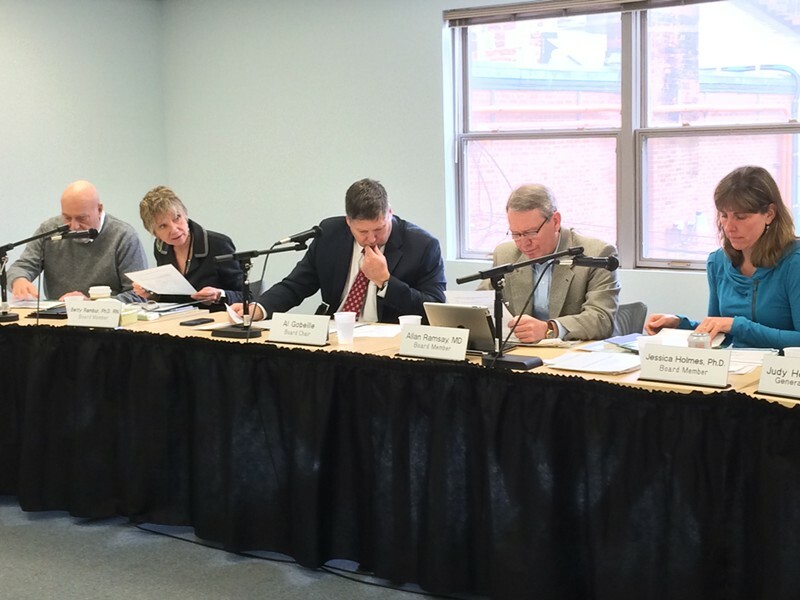 The Green Mountain Care Board discusses how hospitals should deal with excess revenues. The Green Mountain Care Board will likely ask the University of Vermont Medical Center and Central Vermont Medical Center to reduce the rates they charge commercial insurers because of the excess revenues both took in last year. The two hospitals — which are affiliated under an umbrella organization called the UVM Health Network — posted jointly nearly $30 million in surplus revenues for the fiscal year that ended September 30. UVMMC's excess was $22 million, or 2 percent over budget, while CVMC's was $6.9 million, a 4.2 percent variance. A week ago, network officials proposed giving $12 million of the combined surplus to community health programs and $3 million to health-payment reform initiatives. They said they would address the remaining $14 million when they submitted their 2017 budgets to the regulatory board for approval in the summer, intending to lower rates for commercial insurance. Board members agreed Thursday they weren't ready to vote on how the hospitals should address their excess revenues, but several hinted that rate reduction, not community programs, would be their priority. Board chair Al Gobeille said he thought the board should either tell hospitals with excess revenues to cut their commercial insurance rates immediately or figure a rate reduction into the budgets they submit next summer. He said he didn't think the board should get involved in approving community expenditures. After the meeting, Gobeille predicted the board would recommend that a hefty amount of the UVM network's surplus be used to reduce insurance rates. UVMMC and CVMC weren't the only hospitals with surpluses last year. Nine of the state's 14 hospitals had net patient revenues that exceeded their budgets. Thursday, Rutland Regional Medical Center presented a proposal for its $4.1 million surplus. CEO Tom Huebner said he wants to reduce commercial rates on May 1. Ken Libertoff, a retired mental health advocate, suggested the board adopt a guideline that at least 75 percent of excess revenues be used to reduce commercial insurance rates. Last week, several lawmakers criticized the UVM Health Network for promoting its plan for the excess revenues before the board could react. "For me it was very presumptuous to send out a letter, basically a press release, saying, 'This is how we are going to spend the money,'" complained Sen. Richard Westman (R-Lamoille). "It was clearly designed to put pressure on people," he said. Westman serves on the board of Copley Hospital in Morrisville, which had excess revenues two years ago. The board required Copley to cut commercial insurance rates. "The Green Mountain Care Board should treat everyone the same," Westman argued. Gobeille expects other hospitals with excess revenues to come before the board, too, and he said it was appropriate for each to offer ideas to address budget variances.